The new BOWTECH®-ULTRAREST™offers shooters a rest that does not only visually complimate BowTech® bows but is specifically designed to unleash the bows full potential. This will give shooters an deadly combination that can’t be matched. No other rest on the market completes the custom look and feel of BOWTECH® bows like this custom ULTRAREST™. The seamless fit to BOWTECH® risers requires very little adjustment and no extra parts for perfect center shot and tuning. 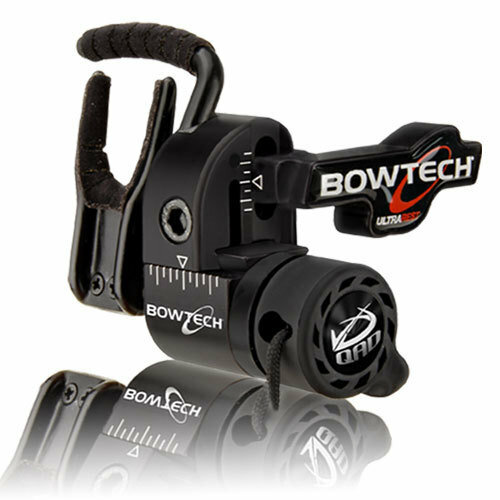 Sporting a mounting block that has literally been machined into the shape of the BOWTECH® logo; the rest appears to be part of the bow. The new launcher has been designed for perfect berger button alignment while eliminating noisy bow shelf contact. The new non slip mounting block sytem eliminates the need for set screws. The shooter can feel confident knowing the BOWTECH®-ULTRAREST™ also includes the renowned features of the Ultrarest HDX™ Available in black, red, or Mossy Oak™. The rest comes with a Limited Lifetime Warranty. Each rest is designed, manufactured and assembled from start to finish by the hands of hard working Americans. Which have helped build it’s reputation as the leading arrow rest in the industry. There are different BOWTECH ULTRAREST versions for different BOWTECH model bows so check with Authorized bow dealers for compatible bow models.